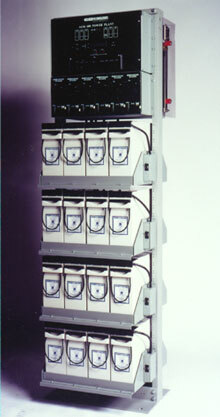 Integrated Rack Systems (IRS) use 48v 30 amp rectifiers with front 150 ahr access batteries to save space. With high-frequency switchmode technology, this system has an optional microprocessor for call in/ call outs, and DC distribution via plug-in breakers. It also has low voltage disconnect and temperature compensation and front access 12v 100, 125 or 150 ahr batteries.